1. Green leafy vegetables: These are loaded with magnesium which helps in combating stress. Low magnesium levels in the body may induce fatigue and headaches. So, load your diet with greens, cooked soybeans or salmon. 2. Avocados and bananas: These potassium rich fruits help in relaxation by lowering your blood pressure. So, go for a banana instead of sweets and other junk food when you feel stressed. 3. Citrus fruits: Citrus fruits are rich in vitamin C, which, research suggests, can lower stress hormones and improve immunity. 4. Fatty fish: Rich in omega-3 fatty acids, they can help in boosting your mood by reducing the surges of stress hormones. If you are a vegetarian, you can include flax seeds, mustard seeds or nuts in your diet. 5. Crunchy food: Munch on healthy crunchy food like carrots, celery, cucumber etc. 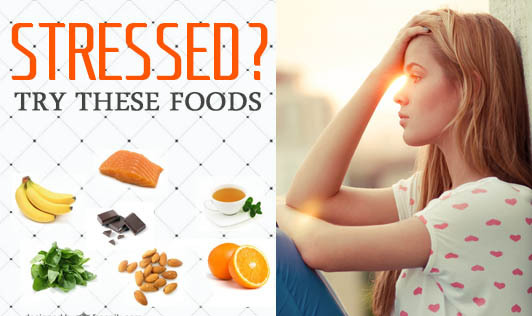 These foods help you relax not by inferring with your hormones, but by the sound! Avoid having chips and other deep fried foods, stick to a carrot or a celery stick! 6. Dark chocolate: No surprise here! Chocolate is a well-known stress buster which increases the feel-good hormones in the body. Choose dark chocolate over milk or white chocolate as they are higher in antioxidants and generally healthier than the other two. The next time you feel stressed and need immediate relief, you know what you need to do!